Tempe, Arizona is home to one of the nation’s largest Universities and Campuses—Arizona State University. With over 80,000 students, over 170,000 residents, and a bustling nightlife, Tempe has seen a steady uptick in criminal prosecution. There are several policing and prosecuting agencies enforcing Arizona’s harsh laws and penalties. Unfortunately, any type of criminal citation or charge in Tempe, AZ can lead to severe and permanent consequences for Defendants. Even a Tempe misdemeanor can leave a permanent criminal record. And a criminal conviction may negatively impact your future, career, finances, and rights. If you’re facing any type of criminal charge out of Tempe, Arizona, it’s imperative to consult with a criminal defense lawyer that regularly defends clients against charges from Tempe, Arizona. Criminal Defense Lawyer Timothy Tobin has practiced criminal law for several years—both as a defense attorney and former prosecutor. Mr. Tobin provides his clients with comprehensive and effective criminal defense services in Tempe, AZ cases. Attorney Tobin is a former prosecutor of Maricopa County—the felony agency that prosecutes felony matters arising out of Tempe Police Department. With his background, Mr. Tobin is knowledgeable and acquainted with the Law Enforcement Agencies, Judges, Prosecutors, and Courts serving Tempe. If you’re up against a misdemeanor charge in Tempe by the Arizona State University Police Department, Maricopa County’s Sheriff’s Office (MCSO) or Arizona’s Department of Public Safety, then your case will likely be held at the University Lakes Justice Court or Kyrene Justice Court. If, in the alternative, you were charged by the Tempe Police Department, then your case would be at the Tempe Municipal Court. The Tempe Municipal court is located at the crossroads of East Fifth Street and Myrtle Ave. It’s located next to the Tempe Police Station and across from the City Hall Parking Garage. Both the University Lakes Justice Court and the Kyrene Justice Court are located at the San Tan Regional Court Center on East Chicago Street in the historic downtown area of Chandler, AZ. It’s across the street from the Chandler Police Station and Chandler Municipal Court. Monday through Friday 8:00 AM to 5:00 PM. Tempe Police Department: Tempe police has more than 350 police officers and 150 civilian staff members. The officers and employees of Tempe Police Department serve over 170,000 Tempe residents and over 80,000 college students. And during the day, the Tempe population increases to over 250,000. In addition, Tempe athletic and entertainment venues cause dramatic population and traffic surges. Misdemeanor cases from Tempe Police Department are sent to the Tempe Municipal Court. Felony cases from Tempe Police Department are referred to the Maricopa County Attorney’s Office. ASU Police Department: Arizona State University’s Police Department serves as the law enforcement agency for ASU property under the control of the Arizona Board of Regents. The Arizona State University Police Department, having mutual agreements with the City of Tempe, also provides law enforcement and traffic control for Tempe streets surrounding the ASU campus. Misdemeanor cases charged by the Tempe Police Department are most often referred to the University Lakes and Kyrene Justice Courts. Felony matters, investigated by ASU police, are referred to the Maricopa County Attorney’s Office. Maricopa County’s Sheriff’s Office (MCSO) and Arizona’s Department of Public Safety: Occasionally, the charging agency in a Tempe criminal case will be State law enforcement. That situation is most common when the alleged criminal conduct occurs on or near an Arizona State highway. Tempe misdemeanor cases from these state agencies are referred to the University Lakes or Kyrene Justice Courts. Felony matters from Tempe are referred to the Maricopa County Attorney’s Office. 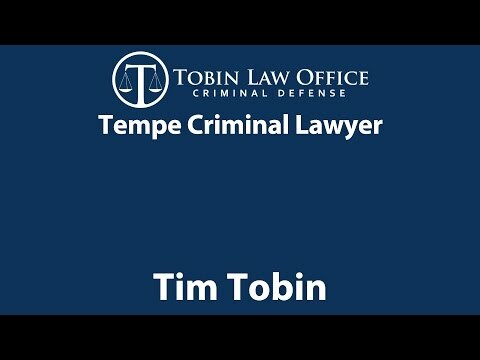 Tobin Law Office Offers Dedicated and Experienced Criminal Defense in Tempe, Arizona Criminal Cases. If you’ve been charged with in Tempe, Arizona, it’s not a good idea to represent yourself. Tempe’s criminal laws are harsh and have lasting consequences. When you try to represent yourself in a criminal case, you’ll find yourself attending several court dates over several months. You’ll be up against trained prosecutors, judges, and police officers. And no matter what the government may tell you, it’s important to realizes that these officials have a specific goal: to convict and punish you without concern for your personal situation, circumstances, or future. Mr. Tobin will tell you, from experience as a former prosecutor, prosecutors and judges aren’t there to help your specific situation. Instead, they’ll see as a number—a person they want to convict and get off their calendar as quickly as possible. If you or a loved one have been charged with a crime out of Tempe, Arizona, you need to consult with a criminal lawyer that’s familiar with Arizona’s complex criminal laws, as well as an attorney who’s familiar with the law enforcement agencies, courts, judges, and prosecutors that handle Tempe criminal cases. Transparent Flat Rates and Payment Plans: Tobin Law Office provides clients with affordable flat rates in Tempe cases. There are no surprises or hidden fees. You’ll know the cost upfront. Former Prosecutor in Tempe Cases: Attorney Timothy Tobin was a prosecutor for Maricopa County’s East Valley Office where he specifically handled criminal cases arising out of the Tempe and ASU police departments. Experienced in Tempe Cases: Practicing in the Tempe, Kyrene, and University Lakes Courts often, Mr. Tobin offers experienced defense in Tempe cases. Personalized Service and Excellent Communication: Attorney Tim Tobin handles all aspects of his clients’ cases. They don’t need to go through support staff for questions or updates on their case. Mr. Tobin’s clients have Mr. Tobin’s personal cell phone and email for accessible communication. 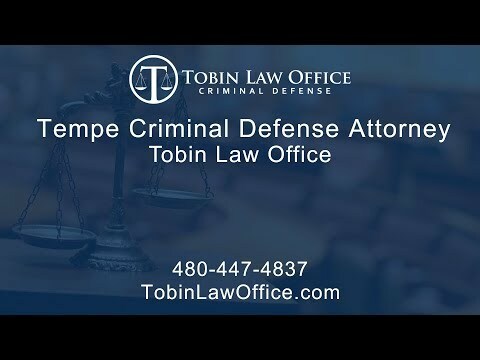 Free and Confidential Consultations in Tempe Cases: When you contact Tobin Law Office about your Tempe case, you’ll be put in direct contact with Attorney Tobin to discuss your case from top to bottom.